Manuscript of Missa O Crux Lignum, a mass by Busnois. The date is not certain but probably mid fifteenth century. Antoine Busnois (also Busnoys) (c. 1430 – November 6, 1492) was a French composer and poet of the early Renaissance era and a member of the Burgundian School. While also noted as a composer of sacred music, such as motets, he was one of the most renowned fifteenth-century composers of secular chansons. He was the leading figure of the late Burgundian school after the death of Guillaume Dufay. Busnois appreciated and extolled the beauty of a simpler more refreshing stylism after the great complexities and darker symbolism of the Gothic methodology. This simpler melodic and harmonic composition allowed an emphasis on individual notes, texts, and harmonies towards a more personal spiritual and moral change for a closer well-being towards others. While details of his early life are largely conjectural, he was probably from the vicinity of Béthune in the Pas de Calais, possibly from the hamlet of Busnes, to which his name seems to refer. He may have been related to the aristocratic family of Busnes. In particular, a Philippe de Busnes, canon of Notre-Dame in Lens, France, could have been a relative. He clearly received an excellent musical education, probably at a church choir school somewhere in northern or central France. An aristocratic origin may explain his early association with the French royal court. As early as the 1450s, references to him appear there, and in 1461 he was a chaplain at Tours. That he was not entirely a man of peace is indicated by a petition for absolution he filed in Tours, dated February 28, 1461, in which he admitted to being part of a group that beat up a priest, "to the point of bloodshed", not one but five times. While in a state of anathema, he was foolhardy enough to celebrate mass, an act which got him excommunicated; however Pope Pius II later pardoned him. He moved from the cathedral to the collegiate church of St. Martin, also in Tours, where he became a subdeacon in 1465. Johannes Ockeghem was treasurer at that institution, and the two composers seem to have known each other well. Later in 1465, Busnois moved to Poitiers, where he not only became "maîtrise" (master of the choirboys), but managed to attract a flood of talented singers from the entire region. By this time, his reputation as a vocal teacher, scholar, and composer seems to have spread widely. He then departed just as suddenly as he came in 1466. With no reason given, the former maîtrise was given his old job back. Busnois then moved to Burgundy. 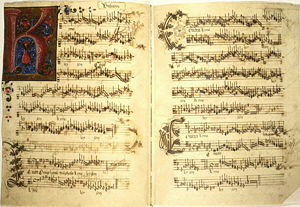 By 1467, Busnois was at the court of Burgundy, and he had begun composing for them immediately before the accession of Charles to the title of Duke on June 15, since one of his motets — In Hydraulis — contains a dedication indicating that he was still Count. Charles, on becoming Duke of Burgundy, quickly became known as Charles the Bold for his fierce and sometimes reckless military ambition (which indeed got him killed ten years later). In addition to his love of war, however, Charles loved music, and in his employ, Busnois was appreciated and rewarded. Also in 1467, Busnois was listed along with Hayne van Ghizeghem and Adrien Basin as a "chantre et valet de chambre" to Charles. In addition to his duties as a singer and a composer, Busnois accompanied the Duke on his military campaigns, as did Hayne van Ghizeghem. Busnois was at the siege of Neuss in Germany in 1475, and survived (or did not attend) the disastrous Battle of Nancy in 1477, at which Charles was killed and the expansion of Burgundy was forever stilled. Busnois remained in the employ of the Burgundian court until 1482, but nothing exact is known about his exploits between then and 1492, when he died. At the time of his death, he was working for the church of St. Sauveur in Bruges (Belgium). Throughout this time he was exceptionally well-known as a composer, and his music circulated widely. The contemporary reputation of Busnois was immense. He was probably the best-known musician in Europe between the time of Guillaume Dufay and Johannes Ockeghem. Busnois wrote much sacred and secular music. Of his sacred music, two cantus firmus masses and eight motets survive (most likely many others are lost). He wrote several settings of the Marian antiphon Regina coeli. Stylistically, his music can be heard as a mid-point between the simplicity and homophonic textures of Dufay and Binchois, and the pervading musical imitation of Josquin and Gombert. He uses imitation skillfully but occasionally writes smooth and singable melodic lines, and has a strong feeling for triadic sonorities, anticipating sixteenth-century practice. According to Pietro Aron, Busnois may have been the composer of the famous tune L'homme armé, one of the most widely distributed melodies of the Renaissance, and the one more often used than any other as a cantus firmus for mass composition. Whether or not he wrote the first mass based on L'homme armé, his was by far the most influential. Obrecht's mass, for example, closely parallels the setting by Busnois, and even the mass by Dufay quotes from it directly. Busnois may even be the composer of a cycle of six masses all based on the same tune, found in Naples, based on stylistic comparison. Busnois also wrote chansons, French secular songs, and these are the works on which his reputation mainly rests. Most are rondeaux, but they include some "bergerettes" as well. Many of these compositions became popular songs, and some were perhaps based on popular songs, now lost. He probably wrote his own texts for almost every one. Some of his tunes were used as source material for cantus firmus mass compositions more than a generation after he died. For instance, Fortuna desperata (which was used both by Obrecht and Josquin) is an example of such source material. An unusual chanson is Terrible dame, which not only is an antiphonal dialogue, unique in the chanson literature, but has an Old French title which requires no specialized skill to translate. While most of Busnois's secular songs are based on French texts, there are also at least two on Italian texts and one on a Flemish text. Most are for three voices, although there are a few for four. Antoine Busnois' secular music in the Renaissance became very popular wherein the music of his chansons were set to French poems and made the performance and appreciation of music an important activity for leisure time. Each person was expected to be able to play an instrument or sing and the development of printing created an accessible market for music education. Busnois excelled in the art of word painting or the musical illustrations of a poetic text. Through such word painting, other composers began to imitate natural sounds through musical means, (i.e. the wind, bird calls, and the sounds in battles). These nuances became the background for the programmatic music in the later Romantic era. Incomprehensibilia / Preter rerum ordinem. Higgins, Paula. Antoine Busnoys edited by L. Macy. Grove Music Online, 2007. Retrieved December 13, 2007.